Earth New Car Smell was an idyllic world where peace reigned supreme and man lived in harmony with nature. 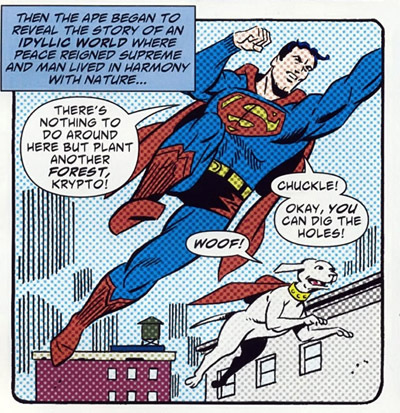 Consequently, Superman and Krypto spent their time planting forests and such. Only one person was dissatisfied with this arrangement, Dex Duthor, who on Earth-1 would have been Lex Luthor, and on Earth-Prime, Dan DiDio. Unfortunately, he found the Fabled Blue Pencil of Schwartzamotto and, as Darkdidio, he used it to remake his universe. Now Wonder Woman had killed a guy, Batman swore like a paratrooper, and Superman no longer hung out with his superdog. Sad.